A little known fact is that only two singers have made the British charts with the song My Way. Frank Sinatra was obviously one and the other one was Welsh songstress Dorothy Squires. The lyrics of this song perfectly sum up her incident packed life. 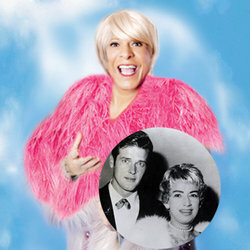 Al Pillay, as Dorothy Squires, portrays her charismatic and determined personality with complete conviction. Dressed in a pink sequined gown and feather boa, he looks the diva. When he performs Ms Squires’ hits, he has the power and expression to give the lyrics their full meaning. I particularly enjoyed the songs Till and Stevie Wonder’s For Once In My Life. Four accomplished gents provide supporting roles by playing keyboards in turn, as backing vocalists and in vignette sketches written by Richard Stirling. These sketches reveal Ms Squires rise to fame and celebrity status from the 1940’s through to the 1960’s, her relationship with Roger Moore and subsequent misfortunes and bankruptcies. Her private life was splashed across the tabloids and she was perhaps one of the first celebrities to suffer the viciousness of certain newspaper publications.